Slate Office REIT (“Slate Office” or the “REIT”) (TSX: SOT.UN) announced today that it is investing approximately $46 million to revitalize two key properties in Mississauga’s Sheridan Park, which will house SNC-Lavalin’s nuclear sector, a major long-term tenant in the park that is committing to extend its lease on a long term basis in the newly refurbished, contemporary facilities. In connection with the revitalization project, Slate Office announced that it has entered into a binding agreement (the “Agreement”) with SNC-Lavalin (the “Tenant”), whereby SNC-Lavalin will lease from Slate Office approximately 215,000 square feet of research, development and office space in Sheridan Park for an initial term of 10 years. Under the terms of the Agreement, Slate will transform 2251 and 2285 Speakman Drive for SNC-Lavalin, reimagining them and fully retrofitting them to create highly functional, contemporary facilities with modern amenities. The REIT anticipates total development costs of approximately $46 million for the revitalization project including (a) its obligations under the Agreement with SNC-Lavalin, (b) the acquisition of 2251 Speakman Drive from Slate Asset Management L.P. and (c) related value-add expenses in connection with the overall revitalization of its presence within Sheridan Park. The development costs will be funded using the REIT’s existing available resources. Sheridan Park provides SNC-Lavalin with a unique opportunity to consolidate around the backbone of its organization: its owned manufacturing facility located at 2233 Speakman Drive. The project will incorporate leading engineering and design best practices to deliver optimum energy and environmental efficiency. SNC-Lavalin’s Nuclear team provides leading nuclear technology products and full-service solutions to nuclear utilities around the globe including customized operations, maintenance and plant life management services, including waste management and decommissioning for BWR, PWR and CANDU-type reactors. Their experts in nuclear steam plant and balance of plant engineering carry out life extension projects, and design and deliver state-of-the-art CANDU® reactors, which are capable of operating on many types of fuel including natural uranium, mixed oxide (MOX) fuel, recycled uranium (RU) and thorium. 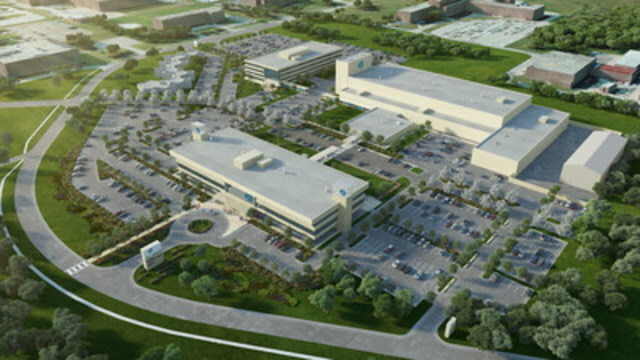 Sheridan Park is one of North America’s first corporate research parks. SNC-Lavalin’s neighbours include a wide range of applied research and product development corporations, each dedicated to supporting research activities spanning across energy, electronics, nucleonics, chemicals, petroleum, pharmaceuticals, engineering and moviemaking sectors. In total, more than 2,700 scientists, technicians, engineers and support staff are employed within Sheridan Park’s boundaries. Sheridan Park offers excellent accessibility to major arterial roadways including Erin Mills Parkway, Winston Churchill Boulevard, and highways including the Queen Elizabeth Expressway, 401, 403 and 407 ETR. In addition, being on the Mississauga–Oakville border means Sheridan Park is serviced at various locations by the routes of two transit commissions with connections to GO Transit and the TTC subway. SNC-Lavalin will lease from Slate Office approximately 215,000 square feet of research, development and office space in Sheridan Park in Mississauga, Ontario. The Lease will have an initial term of 10 years and include an option to lease an additional 28,000 square feet increasing the total area to approximately 243,000 square feet. SNC-Lavalin is an existing key tenant of the REIT, currently with approximately 222,000 square feet under lease, representing approximately 5% of net operating income on an annual basis. Under a corporate reorganization mandate by the Tenant in early 2015, the Tenant committed to consolidating its various office and research premises into a campus-style facility in order to better reflect the Tenant’s image as a global leader in nuclear research and development. The REIT is able to meet SNC-Lavalin’s requirement on the basis of its (a) existing tenancy and relationship with SNC-Lavalin and position as the largest property owner in Sheridan Park (b) ability to deliver sound leasing economics by retrofitting an existing property with innovative and contemporary building systems and (c) ability to provide the tenant with a strategic location for its global headquarters proximate to major infrastructure, transit and amenities. Slate Office REIT is an open-ended real estate investment trust. The REIT’s portfolio currently comprises 47 strategic and well-located real estate assets located primarily across Canada’s major population centres. The REIT is focused on maximizing value through internal organic rental and occupancy growth and strategic acquisitions. Visit slateam.com/SOT to learn more. Slate is a leading real estate investment platform with $3 billion in assets under management. Slate is a value-oriented company and a significant sponsor of all its private and publicly-traded investment vehicles, which are tailored to the unique goals and objectives of its investors. The firm’s careful and selective investment approach creates long term value with an emphasis on capital preservation and outsized returns. Slate is supported by exceptional people, flexible capital and a proven ability to originate and execute on a wide range of compelling investment opportunities. Visit slateam.com to learn more. Posted with permission of the publisher of NRU Publishing Inc. Original article first appeared in Novae Res Urbis – GTA Edition, Vol. 18 No. 34, Wednesday, September 2, 2015. Multiple Myeloma is a rare CANCER OF THE PLASMA CELLS found in the BONE MARROW. The Plasma cells make antibodies to help fight infection, but when these cells grow uncontrollably they become Myeloma cells, hence affecting production of red blood cells, white blood cells, and platelets. This can lead to anaemia, infections, renal failure, bone damage and pain. Multiple Myeloma is a ‘Stealth-like’ disease that often goes unrecognizable until more severe signs appear. Early diagnosis is crucial so that drugs can keep ahead of the Myeloma Protein. There is no known cause, but every day seven more Canadians are diagnosed with this incurable Cancer. Fortunately through excellent Research in developing more effective drugs as well as better Patient Treatments, life expectancy has been extended and quality of life improved. MYELOMA CANADA is a National organization devoted to improving the lives of Myeloma Patients and their Caregivers.